Is Mrs. Ullman trying to lead us into temptation? Anyhow, she's in a rather seductive pose on this photography, looking a little like a Vamp. This impression is intensified by the huge dark shadow on the wall. An appealing cover with well selected colours to the subject. 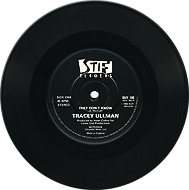 The title track again a cover version of a Kirsty McColl song (Buy 47) done nicely. 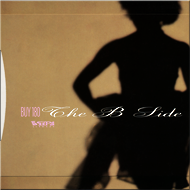 The flip side is displaying just the shadow magnified, corresponding to the song 'The B Side', a brilliant idea.